Breast cancer is one of the most prevalent cancers and is the leading cause of cancer death in women worldwide . The treatment of breast cancer is multidisciplinary and requires detailed risk stratification. Lymph node status is one of the most important factors guiding the subsequent management and prognosis [2-5]. Therefore, assessing lymph node status is of paramount importance in treating patients with breast cancer. In the era of advanced molecular imaging, many state-of-the-art noninvasive imaging modalities have emerged; yet, sentinel lymph node (SLN) sampling remains the procedure of choice in detecting regional lymph node metastasis in early-stage breast cancers,. Owning to its high diagnostic performance and prognostic significance, SLN sampling has become standard practice,. Colloid materials in the tissue can be absorbed and transported by the lymphatic system, and introducing a radiolabel to the colloid material makes it suitable for SLN mapping. Ample studies have demonstrated that radioactive colloids are highly reliable and capable of finding SLN, and radioactive colloids are even superior to their similar counterpart, blue dye,. Besides these advantages, radioactive colloids allow preoperative SLN imaging (lymphoscintigraphy), which is noninvasive and useful in guiding intraoperative nodal localization with a hand-held gamma probe . Thus, preoperative radiotracer lymphoscintigraphic mapping is also highly recommended . Despite the promising features of preoperative lymphoscintigraphy, the imaging procedure might interfere with operating room scheduling, and prolonged scanning time might also intensify patient discomfort. Unfortunately, the imaging time for preoperative lymphoscintigraphy has been less addressed in the literature. There has been only one study evaluating the optimal imaging time for SLN mapping in patients with breast cancer . Furthermore, the most commonly used radioactive colloid in Taiwan is radioactive phytate (Tc-99m phytate), which is not commonly used around the world, and is different from the radiotracer used in the aforementioned study. Because the physical properties of each radioactive colloid are quite different, it might not be possible to generalize the study results of one radioactive colloid to other radioactive colloids,. Therefore, the ideal preoperative imaging time for Tc-99m phytate lymphoscintigraphy for SLN mapping in patients with breast cancer is yet to be thoroughly studied. We herein conduct a retrospective review of breast cancer patients who underwent Tc-99m phytate lymphoscintigraphy for SLN mapping. The preoperative imaging time will be analyzed, and the factors affecting the identification rate on lymphoscintigraphy will be investigated as well. The study was conducted in accordance with the Declaration of Helsinki and was approved by the local ethics committee of the institution (IRB106-182-B). Informed written consent was waived because the study was a retrospective data analysis. We retrospectively reviewed the medical charts and lymphoscintigraphic images of adult patients referred for SLN mapping from August 2013 to November 2017 in Buddhist Tzu Chi General Hospital, Hualien, Taiwan. Only patients with a diagnosis of breast cancer were included for analysis. We included only early-stage (Stage I and II) breast cancer patients, and no neoadjuvant chemotherapy or radiotherapy had been administered before the lymphoscintigraphy. To perform SLN lymphoscintigraphy, Tc-99m phytate was injected intradermally around the tumor or around the areola. The total volume of the radiotracer was 0.4 mL and the total activity was 1.0 or 2.0 mCi. The radiotracer was divided into two or four doses for injection. Gentle massage was applied to the injection sites for all patients. Immediately after radiotracer injection and massage, image acquisition commenced using a dual-head gamma camera (Infinia Hawkeye 4, GE Healthcare, Milwaukee, Wisconsin, USA) equipped with a parallel-hole low-energy high-resolution collimator. The image matrices were 128 × 128 and the energy window was 15% centered over 140 keV. An initial set of dynamic images was acquired at 1 min/frame for 10 min. Subsequently, static images were acquired at 5 min intervals. If there was no SLN on the image, image acquisition was continued until 60 min was reached. All lymphoscintigraphic images were displayed on a GE Xeleris 2.1753 Workstation (GE Healthcare). All patients then underwent SLN biopsy using the dual-tracer method (using both blue dye and an intraoperative hand-held gamma probe). Blue or hot nodes were regarded as SLNs and were sent to the pathologist for frozen section examination. Lymph node dissection over Level I and Level II of the axilla was performed if the frozen section was positive for metastasis; otherwise, lymph node dissection was not performed. If no SLN was identified during surgery, the surgeon performed lymph node dissection [Figure 1]. The data were expressed as frequencies and mean or standard deviation depending on the characteristics of each item. 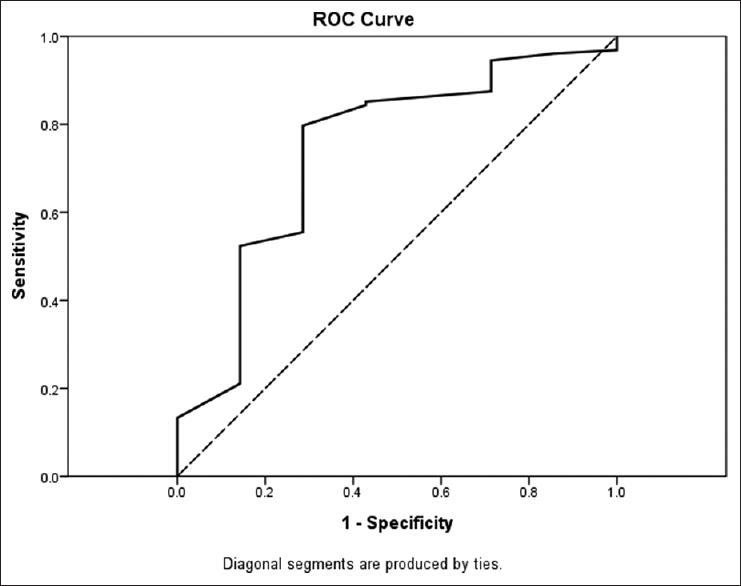 Fisher's exact test was used for bivariate analysis of the association between different variables and the rate of failure to identify SLNs on lymphoscintigraphy. To fit into the bivariate analysis, tumor sizes were separated into two groups with a cutoff of 1.3 cm using the receiver operating curve method [Figure 2]. To eliminate possible confounders, the effect of each presurgical technical and clinical variable on the failure rate was further examined by multivariate logistic regression analysis. We used stepwise analysis to identify the most predictive presurgical variables. Data were expressed as β coefficients and 95% confidence intervals of β and associated P values. Statistically significant differences were defined as P < 0.05. All statistical analyses were performed using SPSS software (version 19.0; SPSS Inc., Chicago, IL, USA). A total of 135 patients were included for analysis and their baseline characteristics are summarized in [Table 1]. SLNs were detected by lymphoscintigraphy in the majority of patients (94.8%). In addition, all SLNs were detected within 30 min of imaging. These SLNs were then detected by the dual-tracer method and harvested intraoperatively. Only seven patients did not show SLNs on lymphoscintigraphy. SLNs were identified in six of these seven patients during the surgery using the dual-tracer method. Only one patient had negative image findings and had no SLNs detected during the surgery. Tumor size, injection dose, and injection site showed statistical significance with the failure rate of SLN mapping on imaging [Table 2]. The technical and clinical variables were further examined by stepwise multivariate logistic regression analysis [Table 3]. The initial analysis disclosed that injection dose (1.0 mCi or 2.0 mCi) was the only independent variable that affected the SLN identification rate. In addition, the number of injections (4 vs. 2) and tumor location (UOQ vs. others) showed marginally significant associations. After eliminating nonsignificant variables and combining the tumor location with injection site, the most significant variables that were associated with nonvisualization of SLN on imaging were a lower injection dose, 4 injections (compared with 2 injections), and radiotracer injection around an upper outer quadrant tumor. Postsurgical pathologic results showed that 25 patients had metastatic lymphadenopathy in the axillary region. Lymphoscintigraphy failed to identify SLNs in three patients. SLNs were successfully identified during surgery in two of these three patients, while no SLN was detected in the other patients even during the surgery. 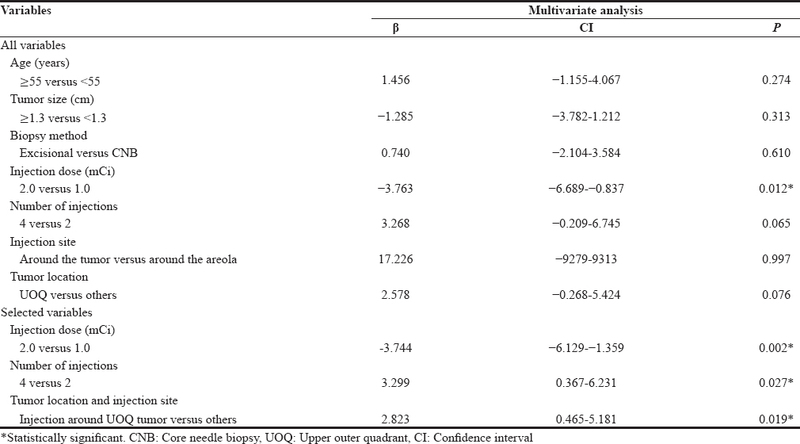 The pathological lymph node status was marginally associated with the failure rate of SLN mapping on imaging [Table 2], P = 0.099]. 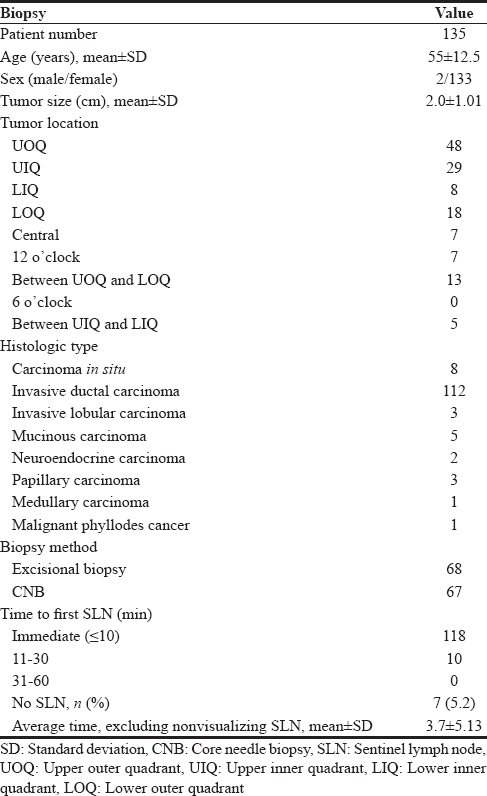 The actual number of metastatic lymph nodes, on the other hand, did not correlate with the imaging or clinical variables, including size of the primary tumor, number of SLNs on imaging, and the time to first SLN on imaging. SLN mapping has been applied to many different cancers, including breast cancer, melanoma, head and neck cancers, and even cancer of the genitalia,. Due to the high prevalence of breast cancer and the advent of screening mammography, more patients can be diagnosed early and sentinel lymphoscintigraphy is increasingly being used. The imaging time for sentinel lymphoscintigraphy is thus an important issue, especially for surgical departments with a tight schedule. Sadeghi et al. studied the imaging time using Tc-99m antimony sulfide colloid and concluded that a 30-min scan is sufficient . However, the particle migration speed in the lymphatic tracts and the time to visualize SLN after radiotracer injection varies according to the particle size,,. The particle size of Tc-99m phytate is considerably larger than that of Tc-99m antimony sulfide colloid,. Nevertheless, our study results surprisingly demonstrated that most SLNs were demonstrated within 30 min, suggesting that the same 30-min scanning protocol is sufficient for facilities with Tc-99m phytate. There are currently no studies that can answer why different colloidal particle sizes have similar rates of nodal uptake. One possible explanation is that the particle size of Tc-99m phytate varies substantially , and the rapid transition and uptake of radioactivity in the SLN might be attributed to the smaller particles. This hypothesis, however, requires additional studies for verification. The SLN identification rate on lymphoscintigraphy in our study population was comparable to other studies using different radiotracers,,. Most SLNs in patients who did not demonstrate SLNs on imaging were eventually identified intraoperatively either by blue dye or a hand-held gamma detector. Studies directly comparing Tc-99m phytate with other colloid radiotracers also showed noninferiority of Tc-99m phytate in terms of the imaging and the intraoperative nodal detection rate, which supports our study findings [21-24]. Although the use of Tc-99m phytate is largely restricted in certain Asian countries, current evidence suggests that it is quite adequate for SLN mapping and should suffice in hospitals performing breast cancer surgery. Taking the rapid tracer migration and high imaging detection rate together, the ideal imaging time would be 30 min. Further delay would probably not increase the SLN detection rate, but most importantly, would impede a high surgical throughput. An injection dose of 1.0 mCi (vs. 2.0 mCi), the 4-injection method, and radiotracer injection around an upper outer quadrant tumor were the only three independent risk factors with statistical significance for nonvisualization of SLN on lymphoscintigraphy. These three technical factors have not been reported to be associated with nonvisualization of SLN on lymphoscintigraphy in the literature. The injection dose, nonetheless, is reasonably regarded as a predictive variable because higher injected radioactivity theoretically produces a more intense signal from the SLN and hence is easier to detect by a gamma camera. Although most studies used a radioactivity dose <1.0 mCi, our study results imply that a 2.0 mCi total radioactivity dose might achieve a better detection rate when Tc-99m phytate is used,,,,,. This phenomenon can be endorsed by the hypothesis we propose. The smaller Tc-99m phytate particles migrate to the SLN faster. Higher injected total radioactivity, with the same distribution of Tc-99m phytate particle sizes, results in an overall higher migrated radioactivity to the SLN. Quantitative analysis of filtered Tc-99m phytate might be able to verify this theory in the future. Another possible explanation for lower doses with similar high SLN visualization rates in other studies is that those studies had longer imaging times. For example, Koizumi et al. performed lymphoscintigraphy with 0.4–1.5 mCi of Tc-99m phytate and achieved an SLN visualization rate of 100% on imaging . However, their imaging time was 1–2 h, which was considerably longer than ours (within 60 min). Although no SLN was found between 30 and 60 min in our study, we still cannot exclude the possibility of an improved SLN visualization rate when the imaging time is extended beyond 60 min. The association between tumor location and the rate of imaging mapping failure might be explained by the obscuring effect of the intense radioactivity in the injection site around the tumor, which hampers detection of the much weaker radioactivity in the SLN. No significant association with SLN visualization was found on multivariate analysis when only the injection site was considered (injection around the tumor vs. injection around the areola). These results suggest that a lower SLN detection rate on imaging is not only related to the site of injection or tumor location alone but also related to a combination of these two factors. Currently, there is no consensus on the number of tracer injections, and the technique varies across different nuclear medicine departments. In our study group, the “2-injection method” and “4-injection method” differs in the volume per injection. A greater volume will be delivered to an injection site when the “2-injection method” is used, which can generate higher tissue pressure to facilitate lymphatic drainage. This is concordant with the findings reported by other groups [27-29]. However, the results are conflicting and the effect of injection volume on the nodal detection rate might be multifactorial . Because the 4-injection method is surely less tolerable for patients, the 2-injection method is thus recommended for routine practice, since the detection rate is not inferior. Finally, our study results showed that the rate of no SLN on imaging is higher in patients with pathological lymph node metastasis. Although only a statistical trend was reached, this finding is congruent with other authors' work investigating the association of lymphoscintigraphic patterns with axillary nodal metastasis,. The increased axillary metastatic burden obstructs lymphatic drainage and hampers radiotracer transition to the SLN. Thus, no SLN can be visualized on imaging. There were several limitations in our study. First, not all of the study participants received axillary dissection. Thus, it is not possible to determine the false-negative rate. Second, the study population was relatively small and the number of patients without successful lymphoscintigraphic mapping was very limited. A larger study population is required to minimize statistical noise. Third, the study was retrospective and thus susceptible to selection bias. And finally, this retrospective study reviewed lymphoscintigraphies across 4 years. The confounding effect of technical maturity on the performance of SLN mapping cannot be excluded completely. SLNs were visualized on lymphoscintigraphy in the majority of breast cancer patients, and most nodes could be shown within 30 min after tracer injection. To ensure a high surgical throughput and to minimize patient discomfort, imaging should not be longer than 30 min. To maximize the rate of successful mapping on imaging, we should avoid using lower doses of Tc-99m phytate (1.0 mCi), multiple injections (4-injection method), and injection around a UOQ tumor. Mamounas EP, Kuehn T, Rutgers EJ, von Minckwitz G. Current approach of the axilla in patients with early-stage breast cancer. Lancet 2017. pii: S0140-6736(17)31451-4. Giuliano AE, Ballman K, McCall L, Beitsch P, Whitworth PW, Blumencranz P, et al. Locoregional recurrence after sentinel lymph node dissection with or without axillary dissection in patients with sentinel lymph node metastases: Long-term follow-up from the American College of Surgeons Oncology Group (Alliance) ACOSOG Z0011 randomized trial. Ann Surg 2016;264:413-20. Giuliano AE, Ballman KV, McCall L, Beitsch PD, Brennan MB, Kelemen PR, et al. Effect of axillary dissection vs. no axillary dissection on 10-year overall survival among women with invasive breast cancer and sentinel node metastasis: The ACOSOG Z0011 (Alliance) randomized clinical trial. JAMA 2017;318:918-26. Zornoza G, Garcia-Velloso MJ, Sola J, Regueira FM, Pina L, Beorlegui C, et al. 18F-FDG PET complemented with sentinel lymph node biopsy in the detection of axillary involvement in breast cancer. Eur J Surg Oncol 2004;30:15-9. Kim T, Giuliano AE, Lyman GH. Lymphatic mapping and sentinel lymph node biopsy in early-stage breast carcinoma: A metaanalysis. Cancer 2006;106:4-16. Krag D, Weaver D, Ashikaga T, Moffat F, Klimberg VS, Shriver C, et al. The sentinel node in breast cancer – A multicenter validation study. N Engl J Med 1998;339:941-6. Krag DN, Anderson SJ, Julian TB, Brown AM, Harlow SP, Costantino JP, et al. Sentinel-lymph-node resection compared with conventional axillary-lymph-node dissection in clinically node-negative patients with breast cancer: Overall survival findings from the NSABP B-32 randomised phase 3 trial. Lancet Oncol 2010;11:927-33. Chagpar A, Martin RC 3rd, Chao C, Wong SL, Edwards MJ, Tuttle T, et al. Validation of subareolar and periareolar injection techniques for breast sentinel lymph node biopsy. Arch Surg 2004;139:614-8. Pijpers R, Meijer S, Hoekstra OS, Collet GJ, Comans EF, Boom RP, et al. Impact of lymphoscintigraphy on sentinel node identification with technetium-99m-colloidal albumin in breast cancer. J Nucl Med 1997;38:366-8. Giammarile F, Alazraki N, Aarsvold JN, Audisio RA, Glass E, Grant SF, et al. The EANM and SNMMI practice guideline for lymphoscintigraphy and sentinel node localization in breast cancer. Eur J Nucl Med Mol Imaging 2013;40:1932-47. Sadeghi R, Forghani MN, Memar B, Rajabi Mashhadi MT, Dabbagh Kakhki VR, Abdollahi A, et al. How long the lymphoscintigraphy imaging should be continued for sentinel lymph node mapping? Ann Nucl Med 2009;23:507-10. Drenaje M, Desda T. Lymphatic drainage of the breast. From theory to surgical practice. Int J Morphol 2009;27:873-8. Cabanas RM. An approach for the treatment of penile carcinoma. Cancer 1977;39:456-66. Moncayo VM, Aarsvold JN, Alazraki NP. Lymphoscintigraphy and sentinel nodes. J Nucl Med 2015;56:901-7. Imoto S, Murakami K, Ikeda H, Fukukita H, Moriyama N. Mammary lymphoscintigraphy with various radiopharmaceuticals in breast cancer. Ann Nucl Med 1999;13:325-9. Jinno H, Ikeda T, Matsui A, Kitagawa Y, Kitajima M, Fujii H, et al. Sentinel lymph node biopsy in breast cancer using technetium-99m tin colloids of different sizes. Biomed Pharmacother 2002;56 (Suppl 1):213s-6. Lee HS, Kim SW, Kim BH, Jung SY, Lee S, Kim TS, et al. Predicting nonsentinel lymph node metastasis using lymphoscintigraphy in patients with breast cancer. J Nucl Med 2012;53:1693-700. Seok JW, Choi YS, Chong S, Kwon GY, Chung YJ, Kim BG, et al. 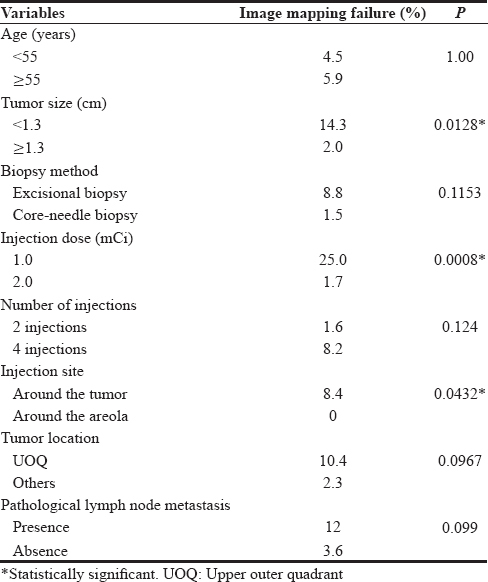 Sentinel lymph node identification with radiopharmaceuticals in patients with breast cancer: A comparison of 99mTc-tin colloid and 99mTc-phytate efficiency. Breast Cancer Res Treat 2010;122:453-7. Koizumi M, Nomura E, Yamada Y, Takiguchi T, Makita M, Iwase T, et al. Radioguided sentinel node detection in breast cancer patients: Comparison of 99mTc phytate and 99mTc rhenium colloid efficacy. Nucl Med Commun 2004;25:1031-7. Takei H, Suemasu K, Kurosumi M, Ninomiya J, Horii Y, Inoue K, et al. 99mTc-phytate is better than 99mTc-human serum albumin as a radioactive tracer for sentinel lymph node biopsy in breast cancer. Surg Today 2006;36:219-24. Moslehi M, Shanei A, Hakimian SM, Mahmoudi G, Baradaran-Ghahfarokhi M. (99m) Tc-phytate lymphoscintigraphy for detection of sentinel node: Preliminary results of the first year's clinical experience in Isfahan, Iran. J Med Signals Sens 2015;5:69-74. Dabbagh Kakhki VR, Aliakbarian H, Fattahi A, Jangjoo A, Assadi M, Khajeh M, et al. Effect of radiotracer injection volume on the success of sentinel node biopsy in early-stage breast cancer patients. Nucl Med Commun 2013;34:660-3. Soran A, Falk J, Bonaventura M, Keenan D, Ahrendt G, Johnson R, et al. Does failure to visualize a sentinel node on preoperative lymphoscintigraphy predict a greater likelihood of axillary lymph node positivity? J Am Coll Surg 2007;205:66-71. Berman C, Williamson M, Giuliano R, Crawford S, Costello D, Shivers S, et al. Comparison of 2cc vs 6cc of radiopharmaceutical diluent in injections for breast lymphatic mapping. Eur J Nucl Med 1999;26:S66. Núñez EG, de Oliveira EA, da Silva NG, Filho RS. Combining dose and injection volume for good performance of a specific radiopharmaceutical for sentinel node detection. Nucl Med Biol 2012;39:145-53. Bourgeois P. Scintigraphic investigations of the lymphatic system: The influence of injected volume and quantity of labeled colloidal tracer. J Nucl Med 2007;48:693-5. Kim H, Shin MJ, Kim SJ, Kim IJ, Park I. The relation of visualization of internal mammary lymph nodes on lymphoscintigraphy to axillary lymph node metastases in breast cancer. Lymphat Res Biol 2014;12:295-300.